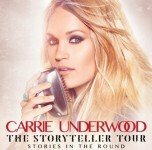 Nashville, TN – (March 31, 2016) – Seven-time Grammy winner and ACM Female Vocalist of t he Year nominee Carrie Underwood has just announced The Storyteller Tour- Stories in the Round will extend through the fall including stops in Los Angeles (STAPLES Center), Nashville (Bridgestone Arena), and New York City (Madison Square Garden). 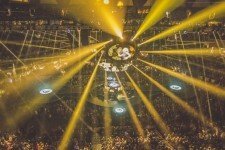 The in-the-round arena tour launched to rave reviews in January and has already played sold out shows across the U.S., including a crowd of over 17,000 at Boston’s TD Garden. Carrie recently returned from Europe where she played five shows in five countries, each part of Country to Country Festival (C2C). The North American tour, promoted by AEG Live, will include special guests Easton Corbin and The Swon Brothers. Tickets will be available for The Storyteller Tour beginning Friday, April 8 at 10am local time at www.aeglive.com. American Express® Card Members can purchase tickets for the U.S. shows before the general public beginning Monday, April 4th at noon local time through Thursday, April 7th at 10 p.m. local time. For information on fan club and D2C pre-sale opportunities and VIP packages go to www.carrieunderwood.fm. Carrie will continue a donation of $1 from each ticket sold at the U.S. dates of The Storyteller Tour to be contributed to the C.A.T.S Foundation to help aid its causes including Checotah, Oklahoma’s education and literacy programs. Es tablished in 2009, the C.A.T.S. (Checotah Animal, Town, and School) Foundation helps with general causes, needs, and services in the area of Checotah, Oklahoma, Carrie’s hometown, to directly impact the community. Each of Carrie’s three previous headline arena tours, 2008’s Carnival Ride Tour, the Play On Tour in 2010, and 2012-2013’s Blown Away Tour played for over one million fans. When the Blown Away Tour wrapped in 2013, Carrie had performed 112 shows in 110 cities across three continents and six countries, including sold-out shows at London’s prestigious Royal Albert Hall, and two nights at the Sydney Opera House in Sydney, Australia.